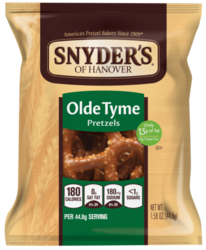 Snyder's Old Tyme Pretzel (Snack Size). Thick, bavarian style pretzel. These 1.5 oz bags pack a quite a snack. All natural, and of course, Snyder's of Hanover Pretzel quality.